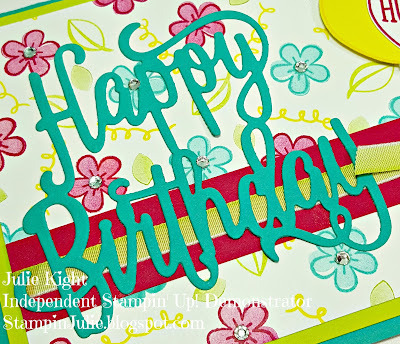 Happy Birthday Gorgeous SU Card: Using New 2018-2020 In-Colors! Hello everyone! I hope you are having a great start to your weekend. 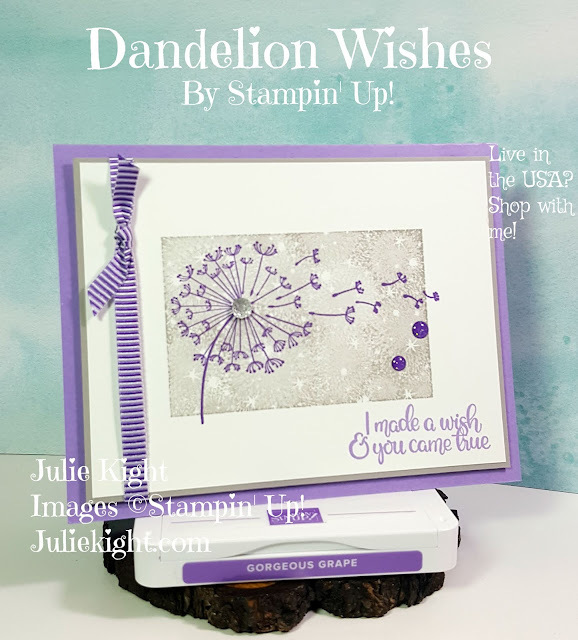 I have been having so much fun creating with some of the new Stampin' Up! colors! 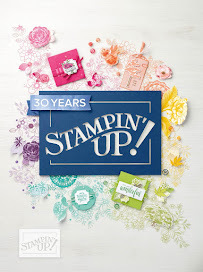 I am sure by now you have heard or seen that Stampin' Up! did a Color Revamp. They like to do this about every 5-6 years to introduce new colors as colors trend in society. There are 16 new and returning colors...which of course means 16 old colors left. Also, every year SU introduces 5 new In-Colors that will be around for 2 years at a time. This years In-Colors are AMAZING! They are perfect colors of the rainbow. I used 2 of these new colors in my card today. 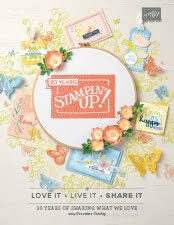 This stamp set, along with it's Thinlit, was introduced last year in the Annual Catalog, but was carried over to this years catalog that will be release on June 1st. 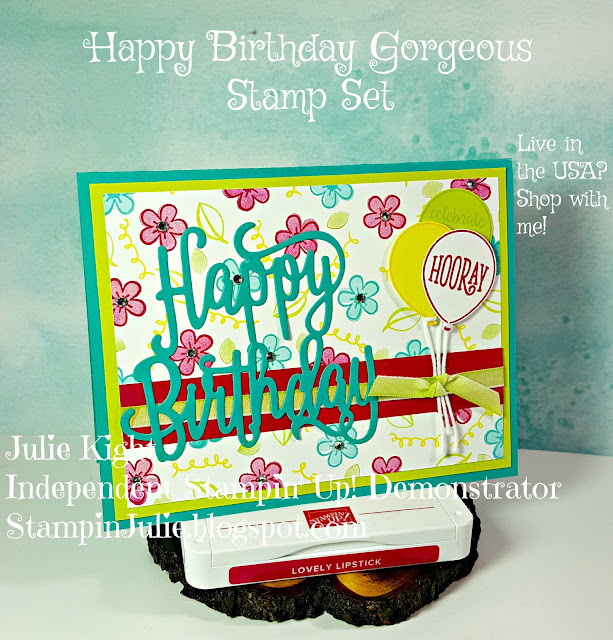 It is such a great stamp set as you can throw a handmade birthday card together in just minutes because of the Happy Birthday Thinlit. I made my own pattern paper with stamps from the set. Some of the flowers are stamped in one of the new In-Colors Lovely Lipstick. 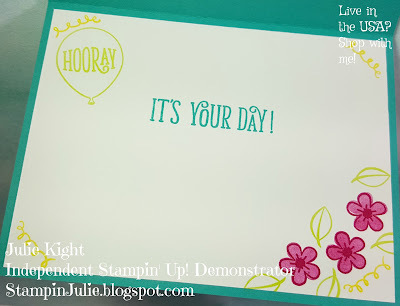 I used the "Stamping off" or "2nd Generation Stamp" to use one ink to get 2 different colors. I first stamped the solid part by first inking the stamp then stamping it once on a piece of scrap paper then onto my card front. Then I inked up the outline and stamped it full strength over the solid part. I did this for all the flowers in the background and on the inside of the card as well. The second In-Color I used was Pineapple Punch for the little squiggles between the flowers. This is a beautiful, bright yellow. The leaves are done in Lemon-Lime Twist and one of the new core colors Granny Apple Green. I LOVE this new green! It is a little dark then Lemon-Lime Twist, so next year when Lemon-Lime Twist retires I won't be too sad. is having knowing that you hand stamped this card just for them! I also stamp the envelope as well, but that is up to you. You already have your stamps and ink out for the card...doing the envelope too isn't that much more effort on your part. 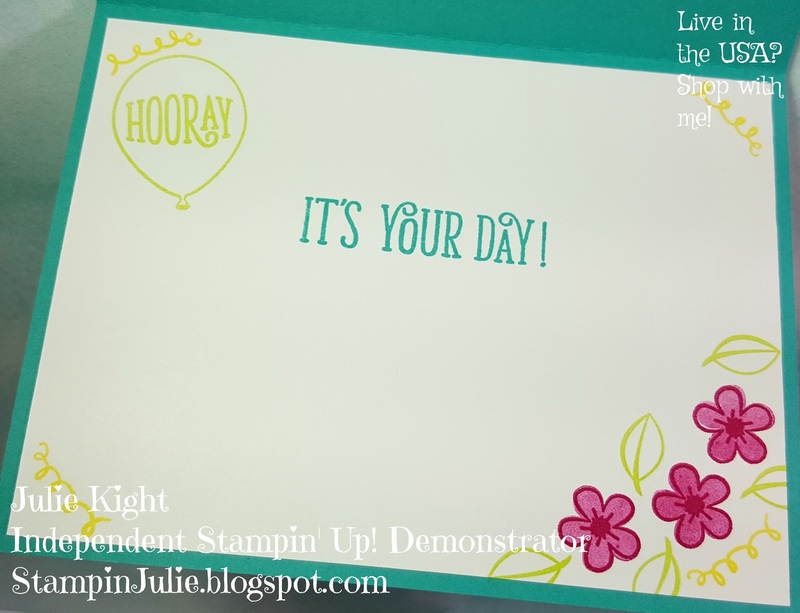 Plus can you imagine the person's face that you are sending this to and how it is going to light up when they are going through all their bills in the mailbox and come across this beautifully, colorful stamped envelope. It will make their day!!! Here are all the items I used on this card. Feel free to click on any of them to purchase that item. Thank you so much for taking time out of your busy day to read my blog and to look at the items I have made. It means the world to me! I know that time is precious and sometimes hard to come by with life today so I really do appreciate it. I hope you have been inspired to make a card or something creative for a friend or family member, or maybe someone you barely know but you know needs a little boost in life by a kind gesture. 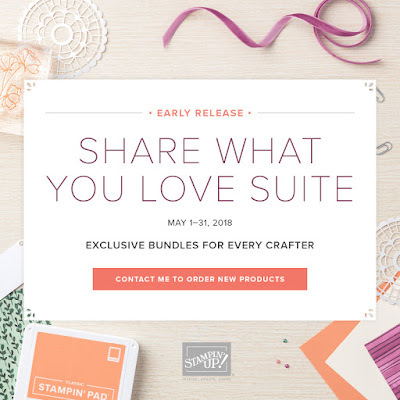 If you have any questions about anything you see here today or about Stampin' Up! please feel free to ask me. My contact link is HERE. Have a great day and remember to do something creative every day!